When you are stopped by a law enforcement officer and cited for a traffic violation, the penalties often include a fine, increased insurance rates, and a blemish on your driving record at a minimum. Although many people elect not to fight relatively minor traffic citations, such as a speeding ticket, many people subsequently learn that the decision not to oppose such allegations can have unanticipated consequences. The traffic violation could impact your employment, future career options, and eligibility for promotions. If your job involves driving a motor vehicle like a truck driver, failure to successfully contest the charge could force you to completely change your occupation. Our attorneys have acquired a highly acclaimed reputation for defending the constitutional rights and future of those accused of all criminal offenses and traffic violations. We have also been successful in obtaining dismissals, acquittals, diversion, and significant reductions in charges and penalties. Both of our founding partners were successful Maricopa County prosecutors before becoming criminal defense attorneys in Mesa. Mr. Hall prosecuted well more than a thousand felony cases along with a wide range of juvenile and misdemeanor offenses whereas Mr. Taft tried more cases with a higher rate of success than any other member in the Major Crimes bureau. During his tenure with the prosecutor’s office, he handled cases that spanned the spectrum from Aggravated DUI to First Degree Murder. Our background as former prosecutors allows us to have an insider’s knowledge of prosecutorial strategies and policies. We combine our persuasive trial skills with a tenacious commitment to zealously pursue the best outcome for our clients. Although drivers in Arizona can challenge a traffic ticket without an attorney, this approach comes with many disadvantages. While fines and insurance rate increases can hurt, the time spent dealing with a ticket rather than working also exacts a toll on household finances. Our attorneys can handle many traffic violations without an appearance from our client, and we typically can limit the number of times you appear even if an appearance is necessary. Further, effectiveness in avoiding the adverse consequences of a traffic violation requires a thorough understanding of court procedures, substantive law, the range of penalties, and potential defense strategies. Our Mesa traffic offense lawyers at Tait & Hall Law Firm design our defense strategy based on the specific charge and surrounding facts, but we might challenge the legal basis for your stop, the veracity or accuracy of witness testimony (including those of the officer), the reliability of other evidence, and other defenses based on the specific circumstances of your traffic offense case. Our attorneys regularly appear in court to fight traffic citations, so our clients benefit from our knowledge of the judges that hear the cases, evidentiary and procedural requirements, and alternate sentencing possibilities that could include diversion. Our traffic defense lawyers carefully analyze any evidence, which could include a law enforcement report, statements from witnesses, and physical evidence (e.g., post-accident citations). We work tenaciously to seek dismissal or citations and to preserve our clients’ violation free driving record. Will the disposition of my case result in higher insurance premiums? Could I lose my driving privileges? Do I face a risk of jail or probation? Will my employer, occupational licensing board, university, or landlord be able to obtain information about my conviction? Can retaining counsel improve my prospects for a positive outcome? Whether you need to protect your commercial driver’s license to avoid losing your job or you face potential incarceration for a DUI, our experienced Mesa traffic offense attorneys tenaciously defend our clients to obtain the best outcome. While we always carefully analyze ways to get a dismissal or acquittal after trial, we also explore diversion options that can protect your driving and criminal record and prevent jail time. 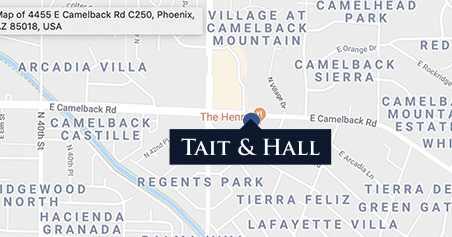 Tait & Hall Law Firm offers a free consultation, so we can explain your legal options, answer your questions, and discuss defense strategies. Call us today at (480) 405-6767.